Based on Ms Lim's projected retirement expenses of about $8,000 in future dollars at 60, Mr Fok estimates she would need a nest egg of $1.3 million to last her for 30 years. He assumed an annual inflation rate of 3 per cent and investment returns of 5 per cent in a "retiree" portfolio. This lump sum is in addition to her annuity and CPF Life payouts. "Even at retirement, we need our money to work for us. If we put all our cash in fixed-income instruments, inflation will eat into it. A typical retiree portfolio comprises 20 to 30 per cent equities and 70 to 80 per cent fixed income of high-dividend blue chips, Reits and bonds," he says. Mr Fok notes that it is important to understand that the rate of investment return and the drawdown rate will determine how many years the nest egg will last. "If the drawdown rate and the rate of return are the same, the principal will be preserved and this can be bequeathed to your beneficiaries upon death. For example, if you invest $100,000 in a diversified portfolio that gives you 8 per cent annually and 8 per cent is drawn down, the principal is not affected. This income strategy will allow the retiree to leave a legacy," he says. 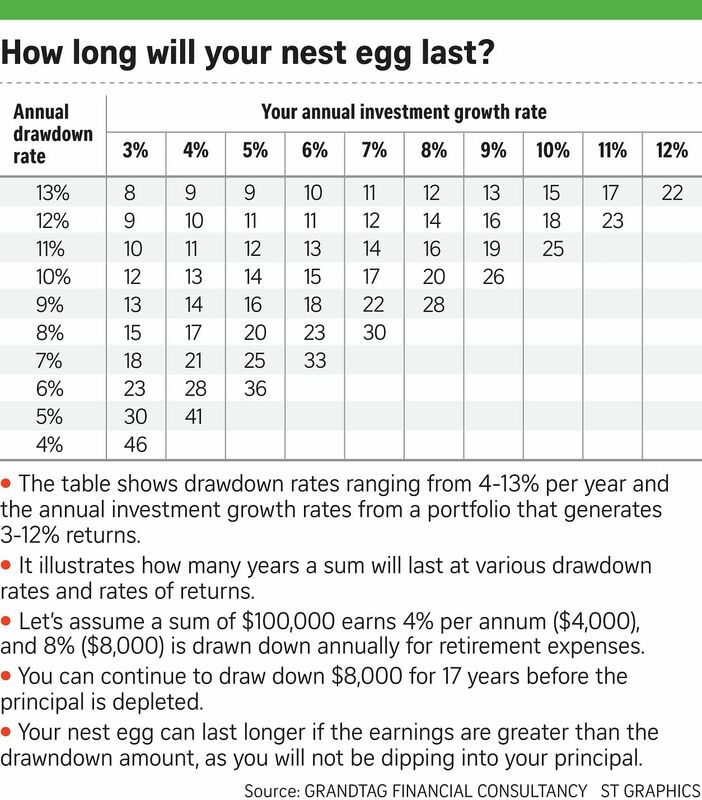 Generally the lower the drawndown rate, the higher the chance your nest egg will last throughout the golden years. "But when the earnings are less than the drawndown, you are dipping into your principal, so your money will not last for a long time," says Mr Fok. If Ms Lim contracts cancer at 60 and is admitted to a nursing home, the annual cost is about $48,000. However, her yearly expenses (excluding nursing care) could be cut to $15,200, or about $1,300 a month, as she would not be, say, driving a car or going on vacation. Mr Fok suggests that as an option to mitigate the cost of staying in a nursing home, she can consider forking out an annual premium of about $9,000 now to boost her critical illness cover by an additional $400,000 till age 75.